Say hello to the latest addition to the Carb Killa® family: all hail the Go Nuts™ bar! This delicious Salted Peanut flavour treat is high in protein and low in sugar, making it the ultimate guilt-free snack to grab on the go. Featuring tons of nutritional benefits and absolutely nuttin’ artificial, the Go Nuts™ protein nut bar is set to revolutionise healthy snacking. The Carb Killa® Go Nuts™ bar is the ultimate guilt-free snack to grab on the go, containing absolutely nuttin’ artificial. There are no artificial colours, flavours or sweeteners and it’s gluten-free too! 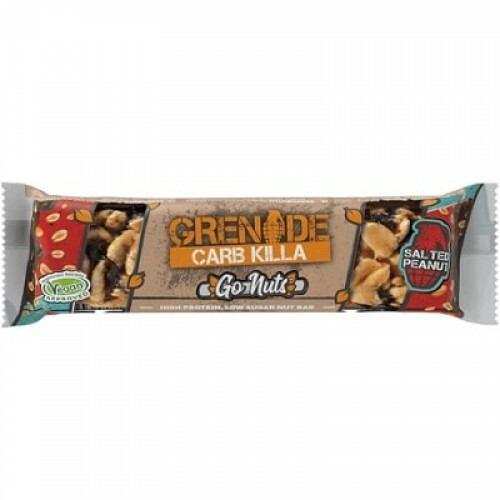 As part of the Carb Killa® range, it’s only right that Go Nuts™ features the same low levels of sugar, with just 2g per bar. Go Nuts™ also packs a 10g punch of protein, making sure it hits the healthy snacking mark. Grenade® caters to life athletes from all walks of life. The Go Nuts™ bar is vegan approved, making it a great choice for those following a plant-based diet. Peanuts (21.6%), Salted Peanuts (18.5%) (Peanuts, Peanut Oil, Salt), Chicory Root Fibre (9.5%), Soluble Vegetable Fibre, Glycerol, Soy Protein Isolate, Rice Protein, Almond Flour, Soy Crisp (Soy Protein Isolate, Fat-reduced Cocoa, Tapioca Starch), Sunflower Oil, Chocolate Drops (1.7%) (Sugar, Cocoa Mass, Cocoa Butter, Emulsifier; Soy Lecithin; Natural Flavourings), Maltodextrin, Emulsifier; Acacia Gum, Salt, Cocoa Mass, Fat-reduced Cocoa, Natural Flavourings (Sesame, Peanut). Allergen Information: May contain Egg and Nuts: Gluten Free. The Carb Killa Go Nuts Bar can be eaten any time of the day - from a delicious snack between meals, to a post workout treat that is high in protein and low in carbs! It should be consumed as part of a balanced diet.